It’s one of those confronting questions that used to have me on the back foot; a straightforward, honest question that in its innocent simplicity completely dismisses the intricate complexities and painstaking toiling of an all-encompassing approach that extends beyond the vineyard to the entire property; it’s a way of life as much as it is an unbending strive for purity and personality and ultimately an unadulterated expression of soil and place. But it is a fair question, for the average wine consumer or even the enthusiast who wants to cut through the mumbo jumbo and get to the crux of the matter – just enjoying the wine. My reply was “Yes. Absolutely; I am convinced biodynamic wines taste – different.” I pause… allowing the inquisitiveness to build at the same time teasing the sceptics. I then state, “How do I taste this difference?”, at the same time motioning to my sommelier to start pouring the first wine perceiving it’s time to alleviate the impatience of our thirsty audience, and proceed to explain, “Energy and texture are the sensations that I perceive most in biodynamic wines – a tangible vitality in the wine and texture that is so slippery-smooth and a gentleness to the wine the belies a palpable intensity – of flavour and liveliness”. There’s an audible shifting of seats and that gaze from the audience that clearly indicates they all think I have been ‘smoking something’ and things are getting way too metaphysical. It’s that moment when you feel the vibe that you are losing the audience and anymore talk will be futile and only serve to heighten suspicion. So, I say no more, beckoning to try the first wine – which is served blind so there are no preconceived thoughts interfering with this exercise of discovery – sitting back to observe the expressions and reactions of my increasingly disbelieving audience. There’s a lot of sniffing and slurping… frowning of foreheads, raising of eyebrows, shifting of seats, taking in another sip… deep-thinking, audible silence yet changing facial expressions; expressions of satisfaction and visible signs of an adrenalin rush, as if they have just discovered warp speed and taste neurons they didn’t know they had. “Can you feel the energy in this wine?” I ask. “Yes!” comes back an immediate reply in unison. “Yes!” with an even more collective chorus from my audience, taking on a semblance of a gospel hymn and a resounding “Amen” to the preacher. There is consensus amongst my tasters that the wine is intense and complex with an extraordinarily hedonistic bouquet and evocativeness that would suggest a wine of considerable substance, and yet the palate, as invigorating as it is, the mouth-feel is measured and harmonious; it is breathtaking in it power, intoxicating in its perfume, yet so harmonious and gentle – it’s an amazing wine – we all agree. I tell them it’s a chardonnay, to which a collective look of disbelief is substantiated by a taster questioning, “It can’t be… Where’s the oak… and it seems too racy and exotic to be chardonnay”. In reply, I explain there is no new oak used here, as the winemaker wants the individual character of soil and climate of each block (read separate vineyard) to express itself in the wine, thus is wild yeast fermented in a mixture of old oak and clay amphorae with no sulphur added and the ferment very slow, sometimes up to a year. With such a long ferment, the wine is very stable and bottled unfiltered with little or no sulphur added. 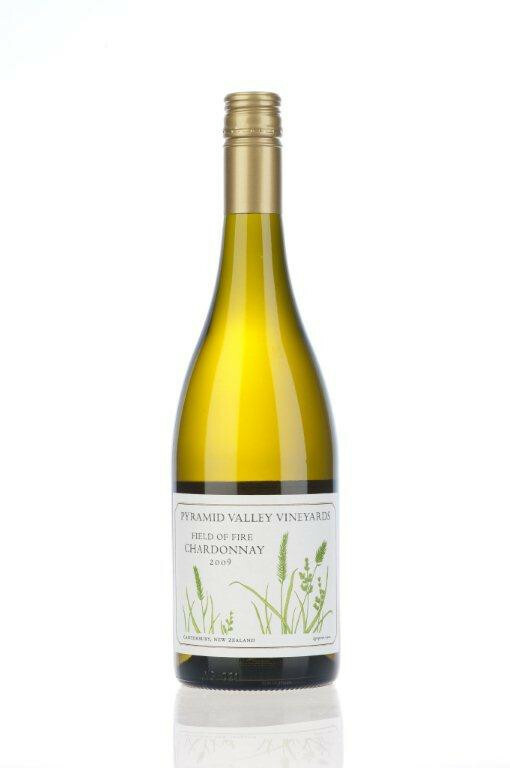 I reveal the wine; a 2010 Pyramid Valley ‘Field of Fire’ Chardonnay, from Waikari in North Canterbury, about an hour’s drive north from Christchurch, New Zealand; to which there is a good deal of confabulation and acknowledgement of the wines complexity and above all – sheer drinkability. I begin telling my audience of visiting this vineyard, with its rolling hills and lush countryside, the air sweet with wild flowers. 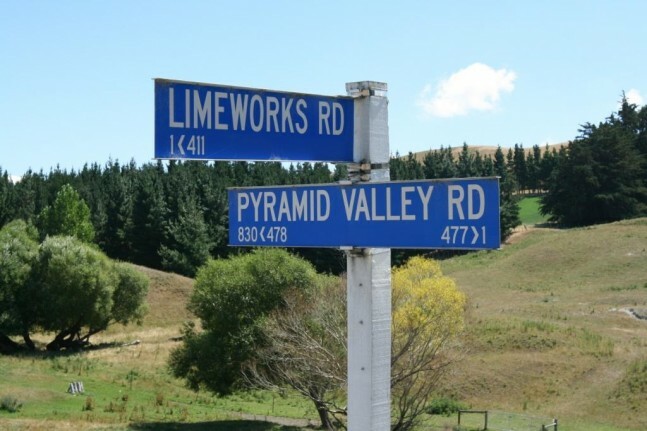 There are craggy limestone outcrops that signal one is getting close to Pyramid Valley, in the knowledge this is one of the few vineyards regions in New Zealand that have clay-limestone soils. I met with Claudia Weersing, who immediately asked if I would like to taste some wine, however I said with the limited time I have, I would much prefer to walk around the property with her. This was a good outcome as you really get a sense of the different aspects of each block and I now have a blueprint in my mind of their vineyards and can translate this to their individual wines. I could also have easily followed their Labrador straight into the water dam; so refreshingly inviting it looked that summer’s day. That may well explain the palate structure of the wine, although I see much more in this and as hedonistic as it is, I can’t help making the comparison to Chablis – Grand Cru Chablis – with it’s coiled up power and exhilarating acidity and tension, or energy. This wine may be unconventional in terms of chardonnays international standard (read often boring) and there’s no question the Mike and Claudia Weersing are pushing the boundaries in every respect, to which they have earned the respect and adoration of the New Zealand wine industry. Clearly, I am a big fan, but I want to say it louder, to the whole world wine stage – that Pyramid Valley is the quintessential new generation New Zealand vineyard – that evolution in the New Zealand wine industry is moving fast and there is a ‘coming of age’ with bountiful exciting wines, complex wines with organic and biodynamic vineyards exemplar, and Mike and Claudia Weersing are at the forefront. A hedonistic perfume, initially dominated by esters, dried banana and a mealy-muesli character, breathing out to release golden delicious apple and nashi pear, also a little grilled pineapple (for me, a distinctive New Zealand chardonnay character) but also a degree of richness with custard and cheesy-lactose-brie nuances, further complexity of blanched almonds and a subtle white pepper and horseradish-like spiciness, moreover a profusion of minerality, pumice, wet sand, talc quality. Silky, airy-light palate entry, so un-chardonnay in a way, in the absence of conventional oak, very integrated, slides through the mouth with an intense lemon-edged tanginess and persistent grapefruit flavour, exhilarating stuff, wasabi-horseradish tailing, nice phenolic/blanched almond skin savoury twist and a bit of grubbiness (in the positive sense) with an all-encompassing sense of energy and mountain freshness. Stylistically a dead ringer for Grand Cru Chablis yet has its own distinctive personality; the perfect wine to serve up to ‘natural’ wine cynics, or New Zealand Chardonnay sceptics for that matter. I am also detailing notes of their two home vineyard pinot noirs as they are equally exciting and wonderfully different. Alluring funky, mushroom, earthy aromas, breaths out with sweeter red berry fruit profile, red cherry and rich quince paste like nuances, very earthy, rust and deeply minerally, savoury, meaty, leathery, a decadently sappy style wine and I like it with its sheer drinkability and earthy, bony qualities and intense sweet n sour liveliness, focused, crunchy, juicy red berry fruits and yet a gentle wine, invisible tannins and supple enough to serve with grilled King Salmon. Enchanting perfume, earthy and smoky (as the label says! ), very minerally, terracotta clay, a profusion of red berry fruits – cherry, wild strawberry, a truly wonderful rich and spicy perfume inviting you to the palate with the fruit seemingly brighter and plusher than Angel Flower, also vivacious acidity and a seamless palate with an underlying earthy, sauvage nuance; intense lively farewell with penetrating red fruits – seductive pinot noir at its best. It is quite likely the 2010 vintage will be sold out in some markets, but don’t let that deter you, snap up any Pyramid Valley wine you can get your hands on. 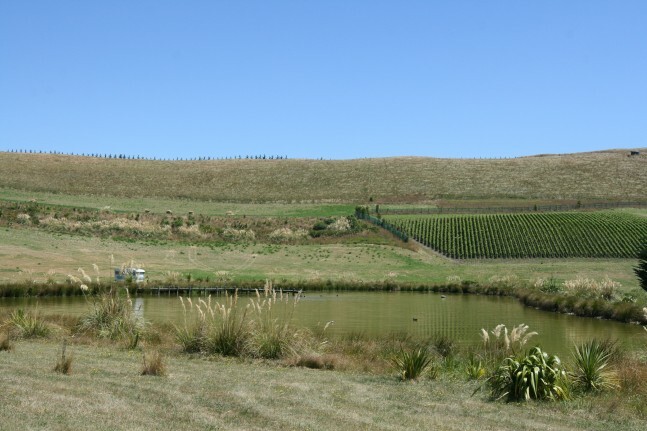 Ata Rangi – There are seeing-eye dogs, sniffer dogs, and then there are wine dogs. Checking brix today before the Syrah pick..